On Second Scoop: Ice Cream Reviews: Happy Halloween Everyone! I hope everyone had a good Halloween, though I realize it's late and many of you probably just did the Halloween party thing over the weekend. That's where these cookies came from. 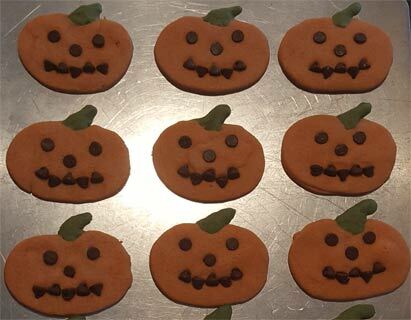 It's a fairly standard sugar cookie recipe with food coloring and chocolate chips for fun. At least everyone got a kick of out them, especially the kids. Ok, back on Thursday with a new post. Note that Dairy Queen announced the new Hot Cocoa Blizzard which is just really sad on their part because it's just a chocolate Oreo blizzard. What's the point of even reviewing it? They couldn't be bothered to add a marshmallow factor or maybe even Hot Cocoa Oreos? Uggg. DQ also brought back the Candy Cane Chill Blizzard (reviewed here). I think DQ needs someone new on the flavor team and I'm open to relocating if that's what it takes to join. Give us something! How about a Candy Cane Brownie blizzard? Candy Cane Bark blizzard? Everyone else is stepping up their game, they should too! Alrightly, keep commenting on my last post and dig in to that Halloween candy! 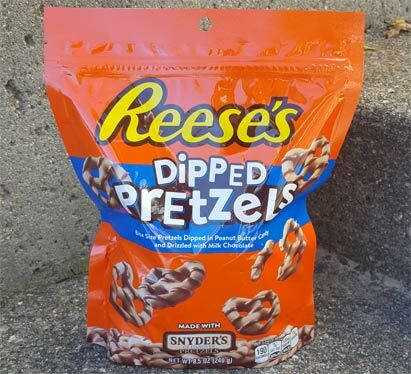 I'll also continue to dig in to this bag of Reese's Dipped Pretzels that I have at work. If you've had Utz Butterfinger Pretzels then these are similar in flavor. I love Reese's and pretzels so this was easy to enjoy. I just saw these pretzels today for the first time but I’ve not tried them yet. But how can Reeses and pretzels fail? Why don’t you review them after you try them, since new ice creams are slim pickens’ ? I was too brief in my praise of them wasn't I? That was actually me endorsing them. I will add a bit to the post a little bit later, sorry about that. I ordered the candy cane chill blizzard today - and they asked if I’d prefer Oreo over chocolate chunks. I did go for the Oreo because I prefer that version. Ha, well, that's neat of them to offer it that way! It brings back both the chill and oreo versions at the same time.